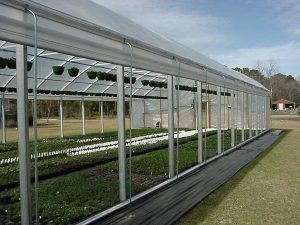 A great way to get natural ventilation in your greenhouse is to install manual or motorized roll up side curtains. These can be fitted onto any greenhouse with straight sidewalls. These are covered with a heavy-duty 12 mil. coated 10 ’x 10′ weave fabric. We recommend that you place a kneewall under the curtain system. This will keep flying debris away from the bottom. It will also keep a standing snow from leaning against the curtain. These are available in 6′, 8′ or 12′ systems. Please contact us for a quote on this product.